“The business outlook for the warehouse market is very positive. The Polish market is far from being saturated and has potential for further growth. The falling unemployment rate may boost development of new warehouse locations due to better availability of workforce there. The growth of the warehouse market is also driven by development of the e-commerce sector which requires warehouse and logistic space. There is no sign of slowdown indicators, on the contrary 2017 may be even better than 2016” – Wojciech Zoń, Head of Industrial Agency, Savills. As stated in „Market in Minutes – Warehouse and Industrial Market in Poland”, in H1 2017 almost 800,000 sq m of modern warehouse and industrial space was developed, 17% up year-on-year. The largest projects were: an extension of P3 Błonie (47,500 sq m) in Warsaw Zone II owned by GIC, BTS for Kaufland (45,700 sq m) in Bydgoszcz by Panattoni and an extension of Prologis Park Piotrków II (42,200 sq m) in Central Poland. New supply in 2017 should exceed the 2016 level (1.2 million sq m), considering space developed so far and record high development activity. Currently highest volume of space under construction is observed – over 1.6 million sq m, two times more than in H1 2016. Among the largest projects under construction are three BTS warehouses of areas exceeding 100,000 sq m: two for Amazon (161,000 sq m in Szczecin and 135,000 sq m in Sosnowiec) both by Panattoni and one for Zalando (130,000 sq m) in Szczecin by Goodman. According to Savills, letting activity in the first half of the year was at high level. Take-up stood at 1.9 million sq m which was one of the highest level ever observed and almost 50% up compering to H1 2016 (1.3 million sq m). 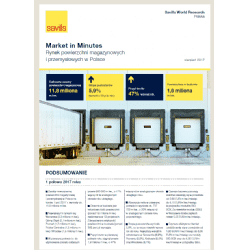 Majority of demand was generated on the five major markets, of which the largest volumes were observed in Central Poland (24% of the total volume) and in Warsaw (22%). Outside of the major markets significantly high demand was recorded in West region, near German border, where over 105,700 sq m was leased (6% of demand). In H1 2017 the demand site of the market was dominated by BTS transaction of which the largest were: Amazon in Sosnowiec (135,000 sq m), Castorama in Stryków (101,700 sq m) and BSH in Łódź (79,000 sq m) all of them being developed by Panattoni. Despite dynamic growth of the market vacancy rate remains low at 5.9%, just above the 3-year average of 5.5%. In the next several months a significant increase of vacancy rate is not forecasted, as ¾ of the under construction space is already committed to. Effective rents are stable and range between EUR 1.80 sq m/month and EUR 3.00 sq m/month in the case of BIG BOX and up to EUR 4.80 sq m/moth for SBU.